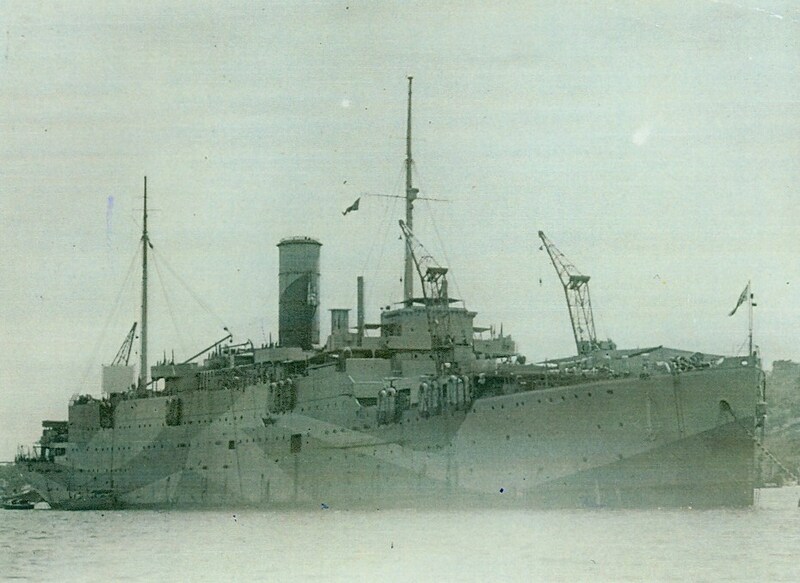 Charlie Baker was a former Shipwright onboard HMS Ausonia, joining the ship in May 1944 just as the ship was preparing for her maiden voyage as a Fleet Repair Ship. He continued to serve on her out in the Far East for another two years and then, years later as a civilian dockyard worker he helped with her post war refit at the Chatham Dockyard. Charlie, who at the time was still doing volunteer work in the Dockyard Museum, soon became my Ausonia technical advisor. Very knowledgeable on all things nautical and always happy to help I am indebted to him for his advice on specific parts of HMS Ausonia where I could find no photographic evidence or the plans were not clear. The following text was taken from his letters along with two of his detailed sketches in which he tried to answer some of my questions regarding the ship. 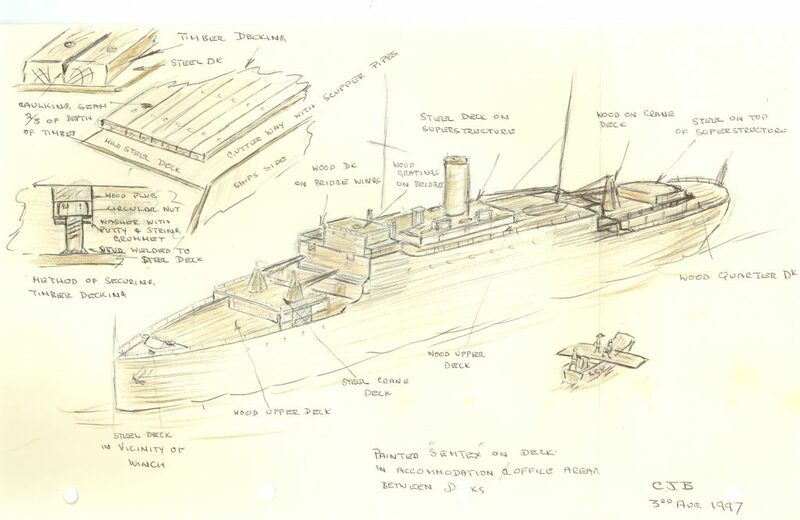 Charlie’s sketch illustrating the wooden decking of HMS Ausonia. The large white square attached to the after crane jib is the portable cinema screen. 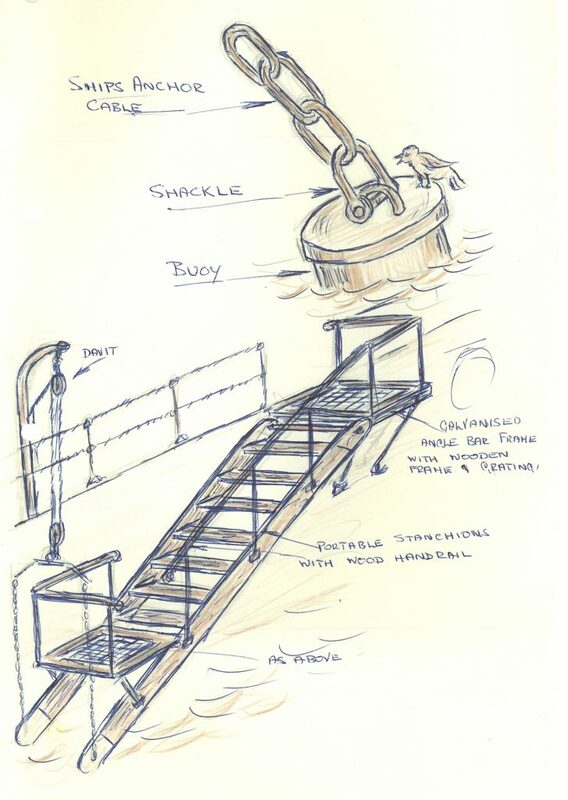 Charlie’s sketch illustrating the accommodation ladder on HMS Ausonia. His memories of the ship are included in the Anecdotes & Memories page.